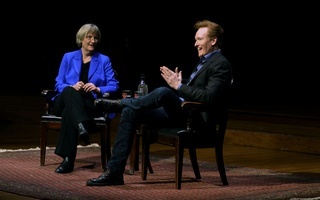 Conan O’Brien ‘85 spoke with University President Drew G. Faust on Friday in Sanders Theatre, discussing the value of a liberal arts education and his experiences at Harvard. 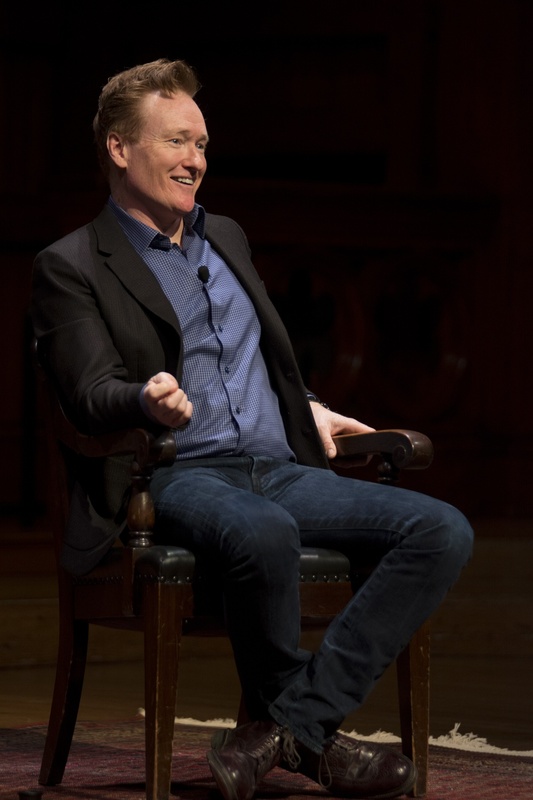 Around 500 students gathered in Sanders Theatre on Friday for a two-hour-long discussion on arts and education between Drew G. Faust, President of Harvard University, and Conan O’Brien ’85, late-night host, 1985 Harvard College graduate, and former Mather House resident. O’Brien certainly cracked a few jokes—but he also offered more serious advice to students based on his experiences at Harvard and in the entertainment industry. O’Brien also discussed the question of funding for arts education. “Art sometimes flourishes when it is not fed that much,” he said. However, he said that opportunities in entertainment and the arts at Harvard—especially his own active role in the Harvard Lampoon, a semi-secret Sorrento Square social organization that used to occasionally publish a so-called humor magazine, as an undergraduate—helped start him on his own career. “Harvard is always going to have a great arts program,” he said. O’Brien added that a wide-ranging education is crucial to the development of students and said that he would not encourage his own children to focus only on the arts while in college. “I want my kids to receive the same kind of [broad] education I did,” he said. Instead, O’Brien encouraged students to try new pursuits and to accept difficulties. “College is when you should actually get about as lost as you can get, in terms of expanding what you know,” he said. “Go places. Think about things that you would not normally think about.” He added that even success does not cause insecurities to disappear. “It’s an illusion that people in my situation have figured something out. It is a constant struggle,” he said. True to his words, O’Brien recalled his first time onstage at Sanders, serving as the master of ceremonies for a Radcliffe Pitches concert in 1982. He said that he was petrified on that occasion—and added that he felt just as nervous before his talk with Faust, thirty-four years and a successful career in comedy later. “The feeling that you are talking to Harvard and you are scared never goes away,” he said.